Prefab Wednesday – The PLACE House By Heather Johnston. 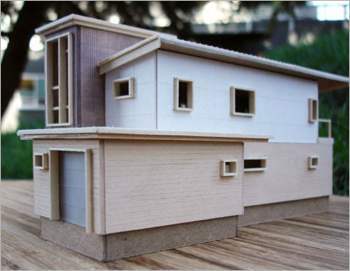 Oooh I think I found a good one here…the PLACE houses by Heather Johnston are beautiful modern prefab kits built in a factory to exacting specifications…and can be delivered anywhere! 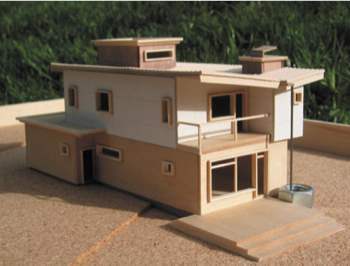 To make things simple, these houses are available in four sizes: tiny, small, medium and large. Easy enough, huh? The medium size house is 2,531 square feet with 3 bedrooms and 3 bathrooms. The base price of the medium house (as far as I could tell on the internet) is about $440,00…but before you turn up your nose at yet another expensive prefab house, check out what that includes: Grading, excavation, storm water management, concrete slab, patio, landscaping, floors, doors, walls, ceilings, windows, exterior siding, roof, appliances, lighting and communication package. I know it’s not inexpensive, but it doesn’t look that expensive with all the included when compared to other prefabs on the market. I am digging the look of these houses…now if they can get the prices down a little more, I am definitely going to build one someday. If you want to learn a little more about the PLACE house, be sure to check out their website. Pretty cool stuff, I gotta say!